Sometimes you stumble across a bridal accessory and it’s 95% perfect. It ticks all the boxes… but… if you had the choice, just a few tweaks here and there would make it more than perfect. And that’s what I love to help my brides with! A little while ago I was able to work with the nicest bride Tracey who was drawn to the Anais silver bridal hair vine. She loved the way it sat in the hair and the pretty little details scattered along the piece. But, she was after a few little changes so it would be the perfect accent to her dress. She had chosen a beautiful ivory lace wedding dress which featured some exquisite floral patterns on the back. I can still remember the day she was first in touch via email and I stared at the photos of her dress for what felt like an hour. Such gorgeous details! She was enquiring whether I could customise the Anais to better suit her lace fabric, and the answer? Absolutely! When I first laid eyes on her dress, I immediately started to think of incorporating some Mother of Pearl flower details into her headpiece. These pearl flowers are dainty and sweet with a timeless touch which suited her wedding dress perfectly. There’s something so divine about the natural shimmer of Mother of Pearl and it’s soft lustre is brought out beautifully next to silver and crystal accents. 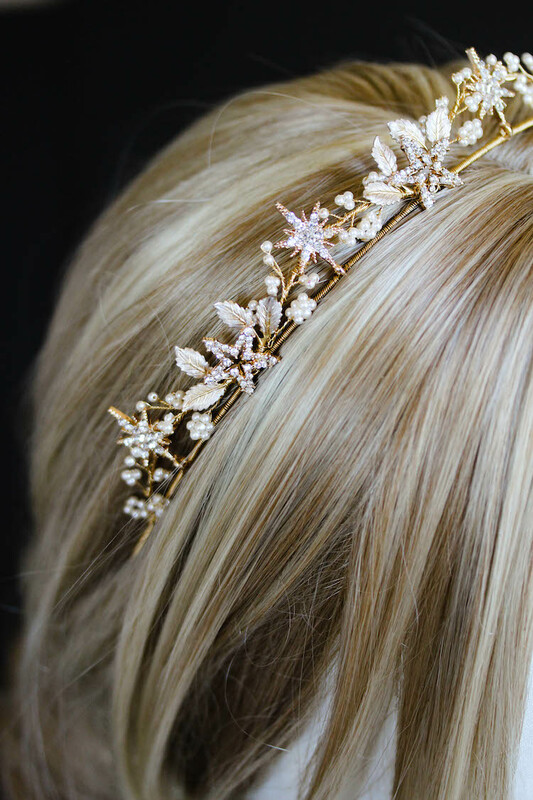 As a hair vine, something I really love about the Anais headpiece is the fact it can be styled in a few different ways. It’s also designed to be worn with a bridal veil, with or without a blusher layer. It’s a wire based piece so it’s very flexible and offers lots of options when it comes to styling. Position it straight along the hairline at the front of the head, a little further back as a headband, wear it as a backwards tiara or maybe even wrapped around a high set ballerina bun! 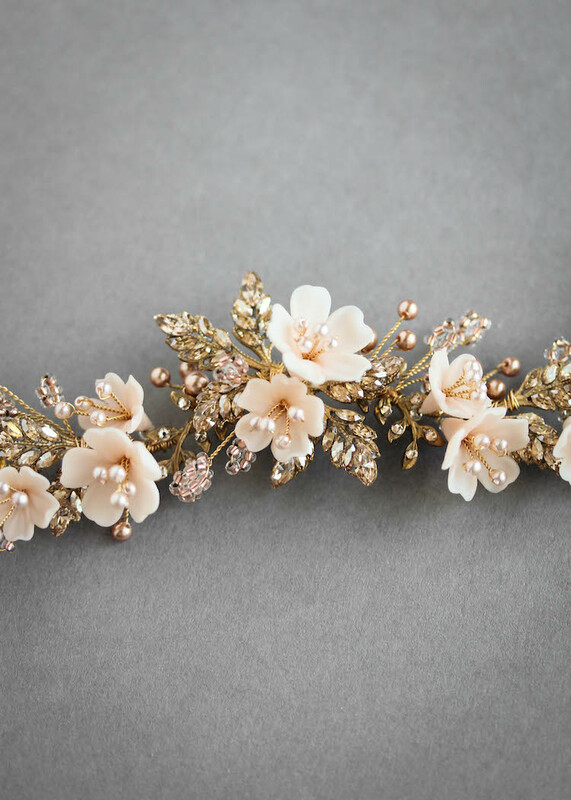 It’s the perfect piece for a bride looking to make a statement, and a gorgeous statement at that. It’s delicate, detailed and can be customised in all sorts of ways to suit you and your wedding dress.